More news from Miriam Cain at Camper & Nicholsons as the owner of the 38m motor yacht Rominta instructs central agent Charles Ehrardt to reduce the asking price by €600,000. 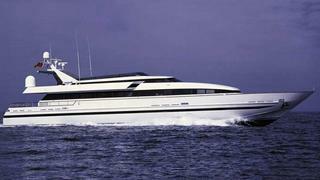 Delivered by Baglietto in 1990 and completely rebuilt and registered in 2001, this superyacht was refitted in 2006. Accommodation is for 10 guests in five double cabins including a master stateroom on the main deck and her berth in Antibes is also available for sale or rent. Rominta is now asking €3.3 million, VAT paid and any sensible offers will be considered.